In this passage we witness, Mary finding the empty tomb, going to Peter and John declaring what she believes. John and Peter running to the tomb to find it absent of Jesus body and only His grave-clothes left behind. John saw and believed but they still did not understand. Until Jesus appeared to them later on in the chapter. John’s account of the empty tomb does vary from the other gospels, but the truths are all the same. 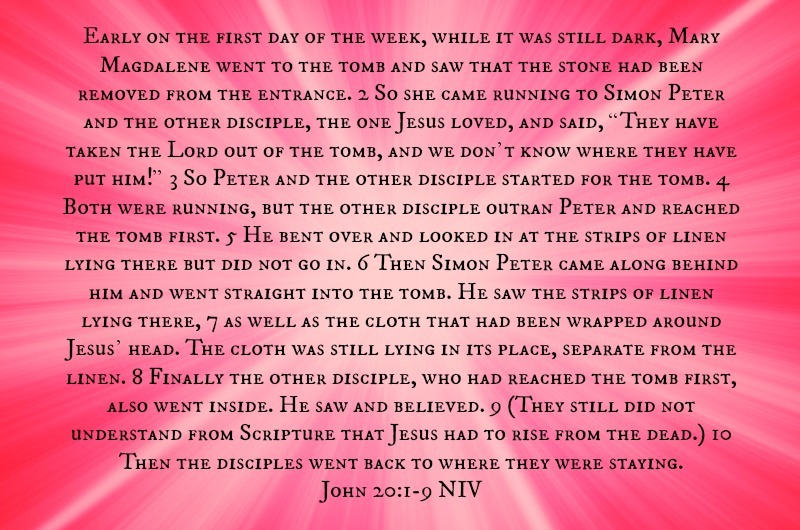 The women went first to the tomb finding it empty. They went to the disciples and told them. The disciples rushed to the tomb finding it as they were told. Angels testified that Jesus has risen and Jesus appears to His disciples before ascending back into Heaven. John explains why he wrote his account. The stone had been rolled away and the tomb that once held our Lord is now empty. Jesus triumphed over death’s grip so that we can be free in Him. This is the good news that we celebrate today and the good news that we cling to for our future. What was done on the cross and in the grave is God’s greatest gift for all mankind. The week leading to the cross, Jesus taught in great lengths about coming again. His coming into this world as a baby was long-awaited by many for their Messiah. His death on the cross and resurrection from the grave was what revealed Him as that Messiah they had been waiting for. Today, we wait for Him to come again. Here is the question you need to ask yourself, “Do I truly believe and know without a shadow of a doubt that I am saved?” If you cannot honestly answer that question and want to be sure go to Be Reserved today and follow along what is written there. If you missed any days of The Road That Leads To The Cross, I provided the links below. Thank you for traveling this road with me this year. I pray you have been blessed in preparing your heart for the greatest sacrificial love that Christ did for us.